I have the easy peasey of painted finishes for you that happens to fit into my "Beach Month" theme. but it still is soft and pretty and beachy, so I still like. I have a new IKEA Tarva in my possession. It is awesome and it might possibly be the best of both IKEA worlds. I'm talking Malm and Rast had a baby. It is big like Malm, but made of wood like Rast so you can paint the holy hell out of it. It is also 20x better constructed than Rast. I approve. This finish works best on raw wood, but if you want to do it on a painted surface I recommend not adding water to your paint in this first step. #1- Mix up a 1 part water, 2 parts paint (Grayish brown- I used C2- Barnacle, it was left over from my office walls.) Don't use a Semi- Gloss finish- you want matte or eggshell. #2 Brush it over the entire piece. Go with the grain, and move quickly so you don't get a lot of overlapping brush marks. You don't want it to be too heavy, you should still see some wood grain. #4 Add 1 part white to remaing paint and repeat. Repeat if you want it lighter. And then I had to test out some new "Fiona" O'verlays that were sized for the Tarva. (P.S. 15% off O'verlays with coupon code YOURMOM15, good til 5/15/12). These were spray painted with Krylon "Nickel"
and then dry brushed with the last batch of paint. 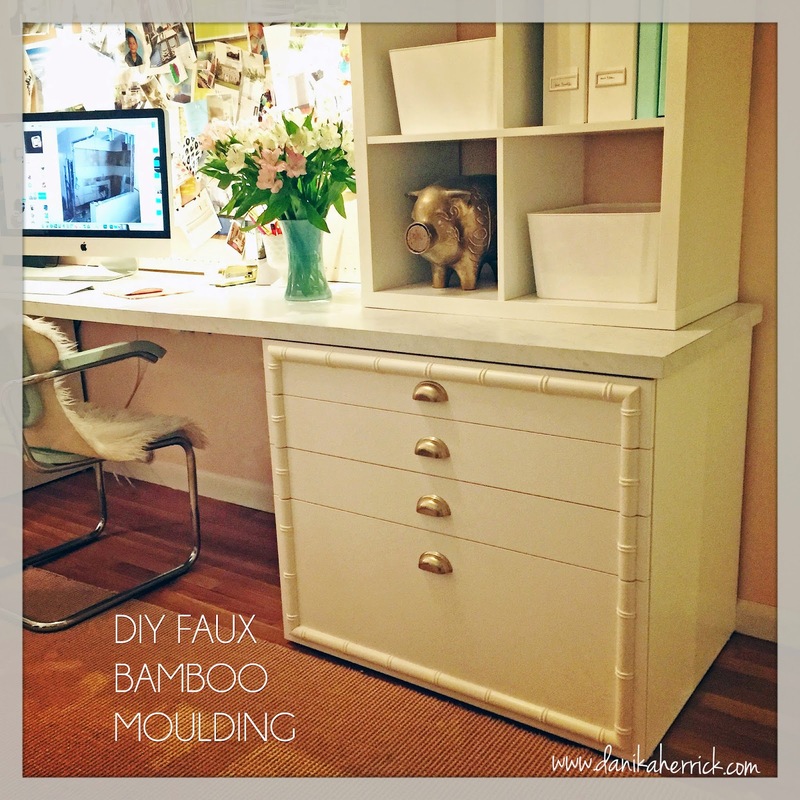 Super easy, and it has me wanting to driftwood my linoleum floors. Wao! good job! It looks beautiful. great ideas too. Love this idea! And so helpful! Driftwood is such a nice look, my mom will be happy to see this too! You are an IKEA hacking machine woman! Those are a match made in heaven. They were meant to be. You are so clever - this is fabulous. As are those knobs. Gorgeous! 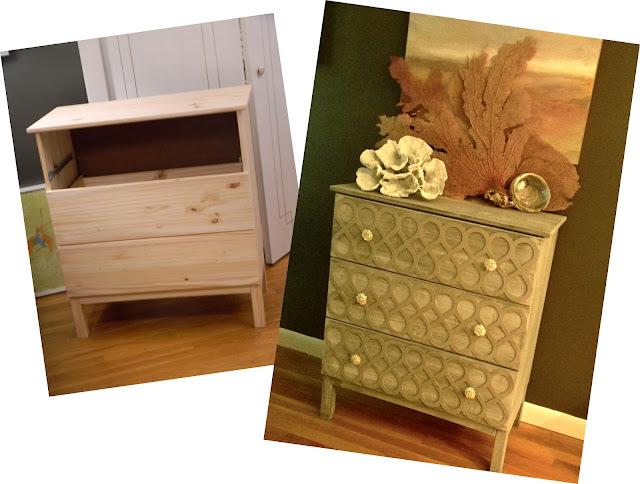 Annie x.
Amazing job giving those Ikea pieces new life! It looks fabulous! So lovely- love that finish and I love that little dresser with the o'verlays even more! Hmmm, now to find space for one of these in my apartment. You've done it again! What a great look. Haven't bee by ikea lately and this has me thinking a trip is in order. This is my favorite of al your projects! Easy, doable and super high-end looking. LURVE it! I am busy pinning this one! Already was going to Ikea tomorrow - will definitely have to check this one out. Oooh, love it! I've been trying to figure out how to get a driftwood finish so this is great! Looks gorgeous! Fabulous job!!! Just bought a crate and barrel dresser for my daughter, cannot wait to Overlay it too!!!! You have such great ideas!! Gorgeous! I think these need to be my new nightstands. Wow the finished product looks amazinggg!! I would have never thought it could have looked so great! FAntastic! Got to check that dresser out, and NEED to try overlays! This piece is absolutely stunning! I'm in awe. Love it. Thank you for sharing! This dresser looks amazing! I am trying to build up the courage to redo several pieces in this finish. I am very much an amateur when it comes to painting furniture though. Between each layer of paint did you sand? Or build up the layers? Then sand before sealing? I would really appreciate your input. I know this sounds crazy but did you mix that white paint in or did you just leave it with the white on top and dip into it. I'm even embarrassed asking. It's seems obvious you would have, of course mixed but, on the other side, you are the first to explain what dry brushing is. Thanks.